The Cutlery Caddy with a Handle and Tapered Sides holds your collection of spoons, forks and knives. 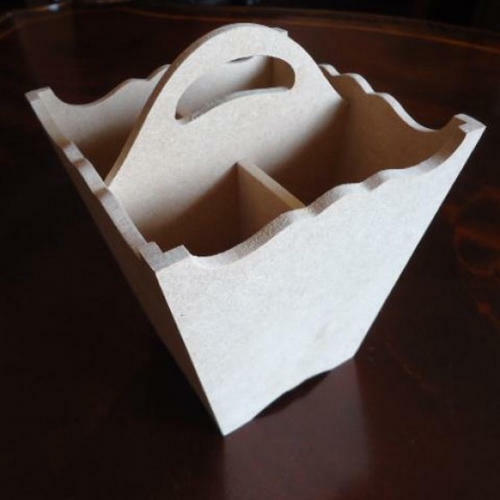 The elegant Cutlery Caddy - With Handle is hand crafted in eco-friendly, pine based MDF & sanded for a smooth finish to work on. Craftslane is a well-known manufacturer and supplier of a range of Hand Crafted Products in MDF, such as Trays, Boxes, Coasters, Photo Frames and many others. We have a diversified product portfolio. Our Company is divided into two Divisions. The Art and Craft Division markets its range of products under the Brand Name Craftslane. This includes undecorated products made using the finest quality imported MDF and sophisticated technology. These products are especially meant for artists to decoupage or paint on. The products which includes a range that are both decorative as well as useful, are sealed and sanded making them ready to use, saving the artist's precious time and effort -a feature not provided anywhere else in the world. Little wonder then, that artists in the USA as well, have received these products very favorably at international exhibitions. The accessories we use, including hinges and clasps are to ensure uniqueness and high quality aesthetics. These products are highly appreciated by our artists due to the durability, high quality finish and very competitive prices. The unique and classic designs & sizes with excellent finish, are unavailable anywhere else in India. In our Art and Craft range,we also have a series of very high quality Golden Synthetic Paintbrushes & Sponge Brushes, which make for ease of application of paint, whether in terms of the spread or the fineness of the work involved. We also have a marvelous range of Heritage products from South Africa, especially for our Decoupage artists. The Gift Division's range is marketed under the brand name Serendipity. The Serendipity range of Trays, Coasters, Tissue Boxes and Playing Card Boxes is well known and is available in premium gift stores all over India. These also make for fabulous Diwali/Christmas gifts and could be used for B2B as well as Corporate gifting.